Friday's action was both expected, and a bit surprising, at the same time. 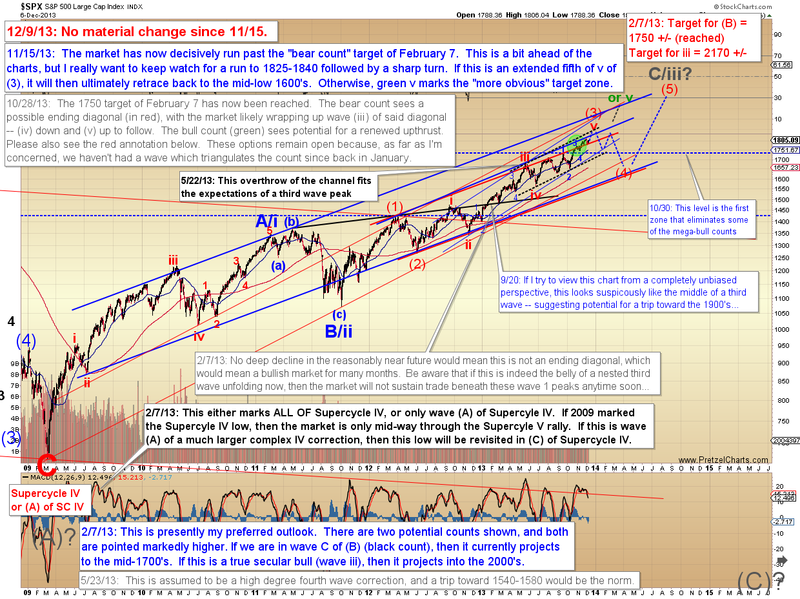 The most recent correction was anticipated to be a fourth wave, and as I've written many times previously, fourth waves are my arch-nemesis. 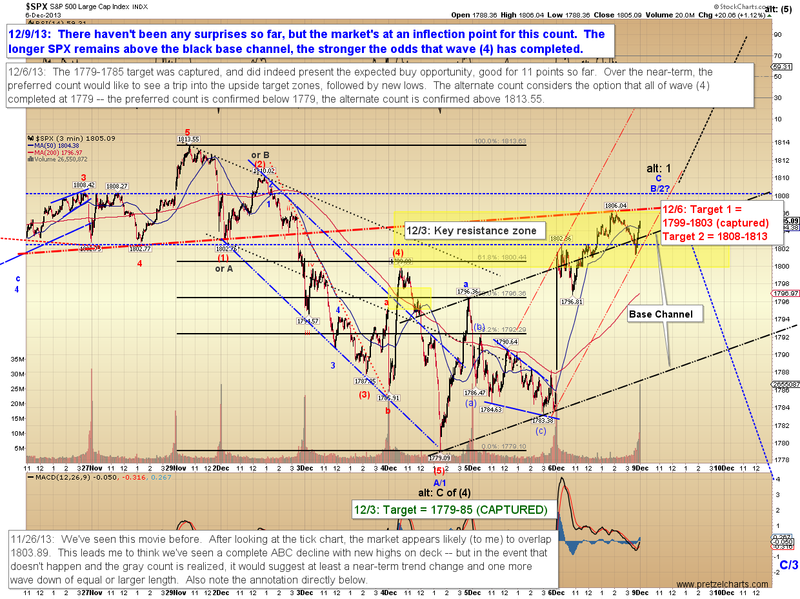 So with the first downside targets captured, and the upside targets now captured, we reach the inflection point and the next trade becomes a bit less obvious than the prior trades were. I'm still marginally inclined to favor the idea of another leg down, but this isn't a cut and dried call as it sometimes is. 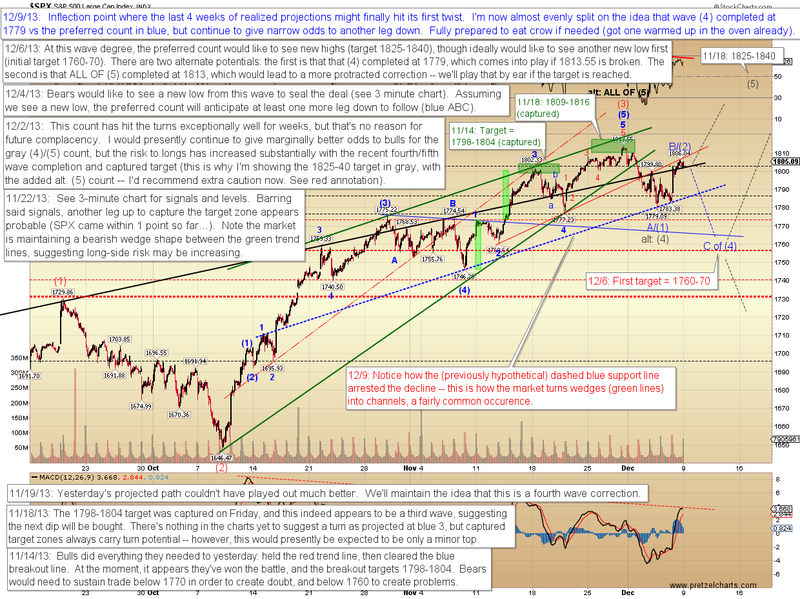 Let's start with the S&P500 (SPX) 30-minute chart. Given that the price action has performed almost exactly as drawn on December 4, one might ask why I have any doubts at this point -- to which I'd answer that first off, it's a bull market, which means surprises are almost always to the upside. Second, it's simply the nature of the game. A few days ago, people were fearful and bearish, because it's in our natures to think and project in a linear fashion; for the same reason, most people are bullish as we open this week. As Robert Arnott once said so wisely, "In investing, what is comfortable is rarely profitable." 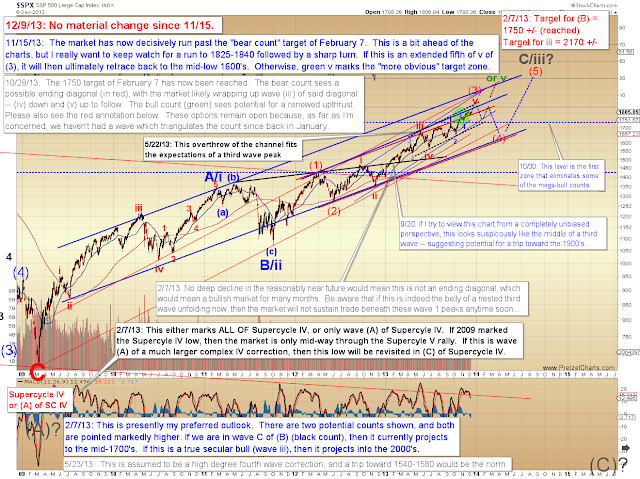 I'd like to revisit the SPX daily chart briefly to help provide a bit more perspective. There's been no material change since November 11, and I'm still anxious to see if we hit the projections of that same date, and if that indeed marks the peak of red v of red (3). At the moment, though, the immediate question is whether wave (4) has completed or not. The invalidation point for wave (4) remains 1813.55, so near-term bears don't have too much real estate in which to make a stand. 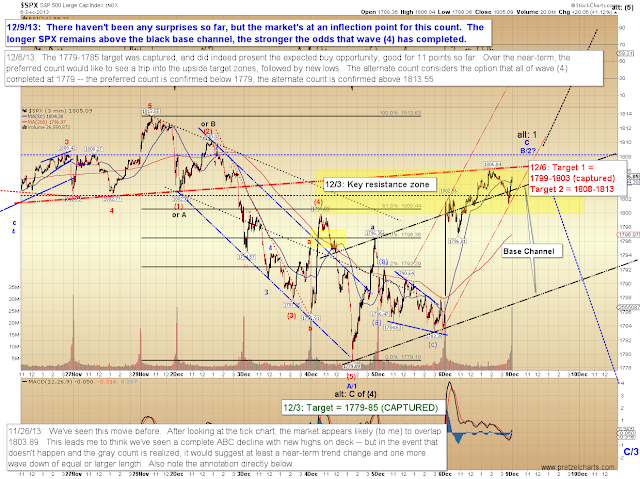 If wave (4) proves to have completed, then we'll turn our attention to the remaining 1825-1840 target zone of the next higher wave degree. Trade safe.